We have them on our smartphones and tablets. On our home appliances and car dashboards. On kiosks and industrial machinery. And they’re appearing in more and more technology. People today have become very familiar with the use of touch screens, and the speed at which they provide the desired functions or information. Even small children have become familiar with touch screen functions, and it can be amazing when you see interactions between toddlers and smartphones. No doubt, touch screen technology is here to stay, and grow. So, what is it about touch screens that we love? Lots of things. The digital age has conditioned us to expect instant gratification on our devices. We don’t like waiting and touch screens accommodate quickly. Tech-savvy customers have come to expect a digitally connected business. Self-order kiosks have become very popular means to avoid standing in long lines. Touch screens are easy to use. They can be intuitive with basic touch and gestures. Just point at what you want, then touch. People entering a large building and seeing an interactive way-finding display in the lobby might be relieved to not have to find and ask someone for directions. Touch screens can even enable guest check-in at hotels. Touch screens are easily accessible. Users with physical limitations and senior citizens often find a touch screen much more user-friendly than a keyboard, let alone a system with keyboard and mouse. And touch screen signage installed in accordance with Americans with Disabilities Act requirements can accommodate people in wheelchairs. Touch screens increase user accuracy. Referring again to self-order kiosks, a user is virtually guaranteed to get the right order as opposed to speaking into microphones at the drive-thru or ordering over the counter. And that also applies to store cashiers using touch screens at the registers. Touch screens can bring instant rewards. If the touch screen display is equipped with Beacon and Bluetoothâ Low Energy (BLE) technology and the customer has the store’s app enabled on their smartphone, the display can provide a personalized experience and offer discount codes or quick purchase suggestions based on the customer’s ordering history on the app. Touch screens are durable. They’re available for outdoor displays that are purpose-built to withstand harsh conditions. These touch screens are not affected by dirt, dust, rain or grease. An outdoor display with protective glass can fend off bumps and bangs too. No article on touch screens would be complete without addressing the obvious: Have you looked at your device’s touch screen after a day of use? See the dirt? It’s an easy clean, of course, but imagine a touch screen in a public environment. That thought alone is a compelling case for a business to clean them regularly and diligently. Be sure to follow the display manufacturer’s cleaning procedure, as you don’t want to affect touch screen performance. What’s on LG’s Menu for QSR? In September and October we detailed how digital signage is improving the QSR experience, from enhanced customer experiences, effortless menu management and effective advertising to expanded drive-thru performance and increased efficiency in the kitchen/food prep areas. 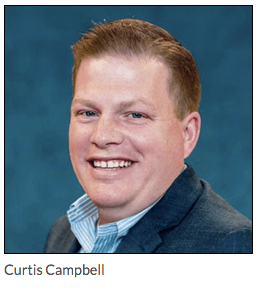 Still, it is not uncommon for QSR franchisees to be hesitant about transitioning to a digital environment. Reasons range from their use of legacy technology to a lack of resources for the significant investment required. So when we’re asked what we can do for a QSR that wants to ease into digital, we start by recommending our very popular digital menu boards along with a SuperSignÔ and webOS for Signage system, and we also suggest finding a good CMS partner. Since content creation, integration and day-to-day management can be a weighty issue, LG offers the solutions to ensure QSR franchisees, content creators and system managers have powerful tools for seamless operation. As the business realizes the benefits of digital signage we can take it to the next level. QSRs can look to a wide range of LG displays to address their needs from engaging customers throughout the store to standing out from the competition. Today’s innovative commercial displays can revitalize the store’s image from the outside in. High-Brightness Outdoor Displays – New XE Series IP56-rated all-season outdoor displays in 49″, 55″ and 75″ class for the drive-thru and outdoor kiosks. With an auto brightness sensor they can adjust brightness depending on the ambient light – a maximum 3,000 cd/m2 makes them clearly visible even in direct sunlight. Menu Boards – SM5KE Series digital signage is the quintessential digital menu board, and sizes ranging from 32″ to 55″ class ensure a good fit in virtually any QSR. The display can even operate as a virtual router which can be a wireless access point for mobile devices. A 24/7 operation rating, conformal coating and auto fail over feature make this series a veritable QSR workhorse. Smart TV Signage – 43” to 55” SuperSignÔ displays can simultaneously broadcast TV programs and QSR advertisements via the built-in TV tuner. Show live sports and local news programs to reduce the customers’ perceived wait time. Self-Order Kiosks – With embedded Beacon and Bluetoothâ Low Energy (BLE) technology the displays can offer a personalized experience to customers that have the QSR’s app on their smartphone. Things like quick ordering of favorites and loyalty discounts can be offered immediately as the customer approaches the display. 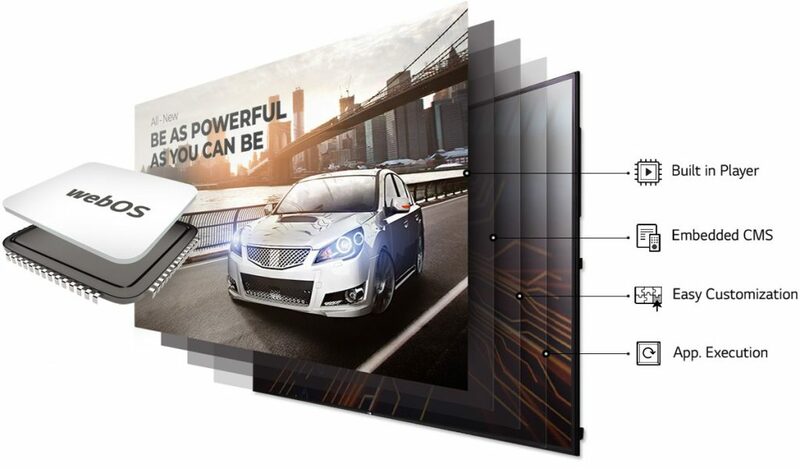 Narrow Bezel Video Walls – 55″ displays with nearly borderless designs can be tiled together to create massive video walls that can stop customers in their tracks with an immersive visual experience. Ultra-Stretch Displays – The 88″ display with 58:9 widescreen format easily grabs attention in wall mounted or floor standing applications. Add touch screen interactivity and you’ve got a seven foot tall Ultra High Definition customer assistant. Open-Frame LG OLED Display – It doesn’t get any more exciting than LG OLED in a QSR. These ultra-thin curved displays can be used in a variety of shapes and be made into video walls too. And dual-sided flat LG OLED displays can swap or mirror content on either side. Transparent Displays – WFB Series signage and LAT300MT1 LED film inspire striking new placements for digital content when the goal is to see not only the content, but what’s behind it. Touch Overlay Kit – The KT-490 attachable touch screen changes standard digital signage into interactive signage. Great for self-order kiosks. In the QSR business, time is money. Resources may be limited and there’s a good chance existing platforms are outdated. Starting with digital menus and an Internet-based content management solution can lay the foundation for an amazing display of ROI. Virtually everywhere we look, we see divisions. Be it politics, how to raise children, dogs versus cats, there never seems to be a winner-take-all argument. And digital signage technology is no different. For a few years now, signage buyers have been presented with an alternative to external digital signage players – namely SoC (System On Chip) and digital signage running on SmartTV displays. Those technology providers & vendors deeply entrenched in the traditional will consistently, readily, and easily discount SoC as “less powerful.” To clarify, those buyers are looking for expansive UHD / 4K video walls, where traditional signage players are daisy-chained (a.k.a. networked together) to create an large, immersive video experience. And again, those entrenched in this way of thinking, will state the list goes on and on. But let’s pause for a second, and think. Why do some believe that a SoC/Smart Signage solution can’t perform in those applications named above? 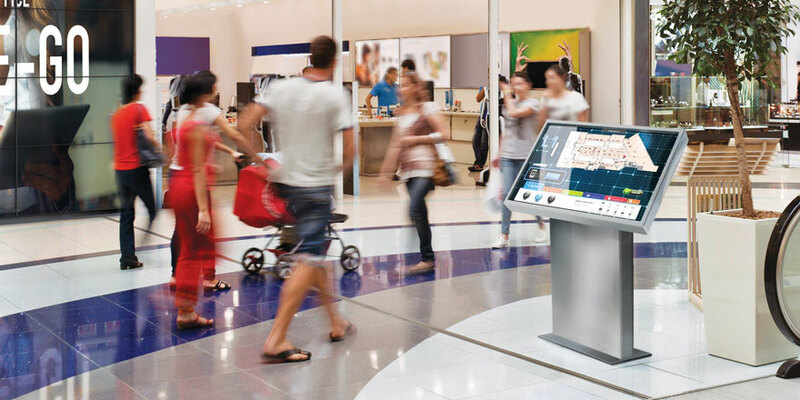 And what about the virtually limitless other applications for digital signage? While three years ago, I might have sided with external players, I am definitely leaning in the opposite direction. Why? Because the technology continues to evolve, the costs keep decreasing, and the list of applications grows longer every day. But don’t worry. I will explain myself. Let’s start first with the financial side of SoC / smart signage. Right out of the gate, with the price of Smart HD displays decreasing every day, add to that notion that removing an external signage player instantly removes what can be a several hundred dollar signage player. Instantly, you are now left with just a SmartTV versus a screen plus a player. Why does this matter? One, reduced cost. Two, reduced infrastructure (meaning all you need is a screen and an internet connection. Add to this fact that Smart screens have integrated WiFi, required infrastructure is further simplified. Additionally, with one less device to support, you have less maintenance costs, fewer chances for failure, and typically one vendor’s throat to choke. This immediately translates to a significantly reduced TCO (total cost of ownership). But my affinity for SoC/smart signage runs deeper than the balance sheet. Looking back up to the top of this post, SoC’s inability to display an expansive video wall is no longer a solid argument. Because at the end of the day, it comes down to the brains behind the screen. If the content management system (a.k.a. the brains behind the display) is capable of splitting the image across multiple panels, in most cases, this becomes a mute point. What about touchscreen kiosks? Since the inception of SoC displays, a number of 3rd party technology providers have brought touchscreen overlays to market, enabling virtually any screen to be made a touchscreen. And today, with LG and Samsung both offering smart signage solutions that feature integrated touch, the simplicity argument surfaces again. And now, let’s look at the management aspect of SoC / Smart signage. When a traditional media player is deployed, setting up the display and tinkering with settings, etc., typically requires a keyboard and mouse. But with SoC / Smart signage solutions, a few vendors have stepped up to leverage the screen’s I/R remote. Now, users can simply pick up the remote, modify settings, increase volume, access additional features, etc. And then, for those SoC / Smart signage solutions that offer live TV integration, changing channels is even easier. Sure, everyone has experienced losing a remote in the couch, but with yet another reduction in the number of devices, your simplicity increases. And to my final point, what about the limitless other applications that are made more simple through the use of SoC/Smart signage? Waiting room signage, conference / meeting room signage, employee-facing / corporate comms signage above time clocks, menu boards / promotional signage in already crowded grocery and c-stores? And what about signage mounted from the ceiling or ad hoc end cap displays in a retail store? All of these deployments become easier as less technology is required. Add back to this notion the reduction of prices of smart displays, virtually any business, which includes small businesses, dusty manufacturing / production / shop floors, crowded kitchens, and a million other environments / businesses can all leverage reduced complexity to ultimately create better customer experiences. I am sure there will be some that will pick apart this argument, and still tell me that I am wrong. But I’ve seen enough, and continue to see the technology improve, to take a big step on the other side of the fence. This may be a little “tongue-in-cheek,” but I believe that innovation sides with SoC / smart signage. Let’s not forget what happened to Kodak – a huge brand that faded away when it failed to innovate and adjust with the times.